Church of St. John The Baptist, 23rd June 2018. In Penal times, an attached Church existed on the site of today’s parish Church. This Church of St. John the Baptist was built in 1828 by Fr. Patrick O’Grady. Older people will still recall the plaque in the left corner of the Church at the back bearing the words “my house shall be called the house of prayer for all nations”. This was in fact prophetic. 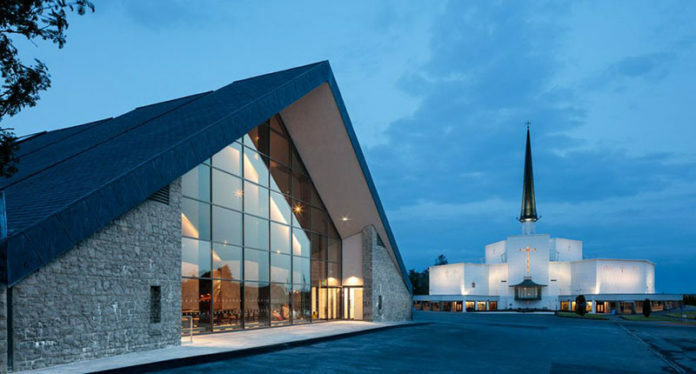 Fifty years later the Apparition of Our Lady led to the subsequent development of Knock as an international Marian Shrine. The gable wall of this Church was the backdrop for the events of the 21st August 1879. As news of the Apparition spread thousands of pilgrims and invalids came to Knock, from far and near, and many extraordinary cures took place. The Apparition gable was so revered by pilgrims that it led to its being almost stripped of its plaster. Prior to the building of the Basilica and the Apparition Chapel this John of St. John the Baptist was the focal point for pilgrims. It is very appropriate that we would rededicate this Church on this eve of the Feast of St. John the Baptist, 190 years after it was built. John the Baptist himself had lived in the wilderness around the Dead Sea. He lived on a starvation diet and so did his disciples. He lived on a dessert diet of locusts and wild honey and wore a wilderness wardrobe of camel’s hair. He was a tough, holy man. He had the courage to challenge the self-righteousness and the arrogance of those who claimed that they had privileged access to God. John the Baptist by contrast emphasises that your only hope was to clean up your life and live as God wanted. John preached a rather grim justice and presented God as a strict judge. By contrast Jesus preached a forgiving love and pictured God as the host at a party or a father who cannot bring himself to throw his children out even when they reject him. In St. John’s Gospel, the Baptist describes himself as the one who is preparing the way. He must decrease and Christ must increase. He proclaims Jesus as the Lamb of God and significantly here the Gable of this Church of John the Baptist provides a background for the Apparition of Our Lady, St. Joseph, St. John the Evangelist and the Lamb of God on the altar of sacrifice. If the walls of this Parish Church could speak then they would tell the story of the struggles of those who have gone before us, who worshipped here and who held on to God in days far more challenging than our own. We are aware of their poverty as they scrapped harvests from ungenerous land. They watched as their sons and daughters left Knock to earn a living in lonely exile. Down the years, this Church at Knock has seen the children of its Baptismal Font grow in the grace of God, some to stay, some to go abroad, some to continue the family name at home, others to carry the Gospel of Christ to the ends of the earth. Yes, this Church has seen the promises of marriage honoured in the face of challenge. This Church has seen its people coming here to bring their pain and brokenness to God. Since 1879 this Church has welcomed pilgrims from around the country and across the world as they come in search of hope and meaning. They come, in the firm faith that the one whose noticed the fact that the wine had run out at the marriage feast at Cana, would bring their worries, their families, anxieties and worries to her Son. In the urgency and bustle of every day we need time to pause, time to reflect, time to pray. This Church re-ordered and made beautiful by all of you is such a place to rest by the wayside on our pilgrim path to God. May this Church be a beacon of hope, enabling people to cope with the disappointment and disillusionment which frequently finds expression in our contemporary culture. I warmly congratulate the Parish Priest, Fr. Richard Gibbons, for his leadership in this and so many other projects. Indeed this project could not have been entertained were it not for the generosity of yourselves, the people of Knock. You have committed yourselves to the project by your generous contributions and your unstinting support for the fund-raising projects.